Edmund James Munckton was born on 5 November 1887 at Bradford Abbas, the third son of Richard Munckton of 5 Smith's Terrace, Newtown. Edmund moved to South Wales and on 22 March 1913, at Blaina-Gwent, Abertillery, he married Mary Davies. They were to have two daughters; Phyllis May (b1913) and Vera Sarah (b1915). The family lived in Llanhilleth, Monmouthshire. Edmund volunteered for active service, enlisting at Newport, Monmouthshire, on 15 February 1915. 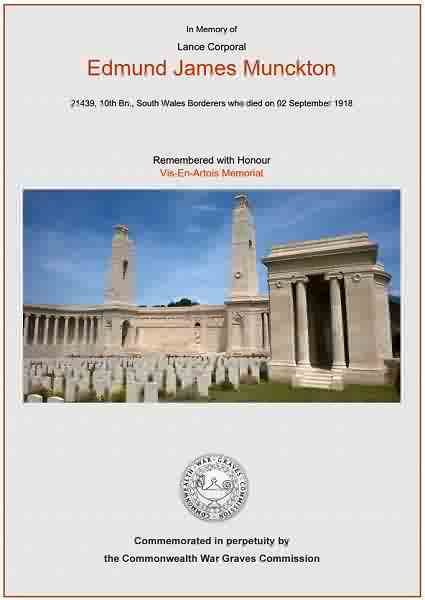 His Service Number was 21439 and he was a Private, later Lance-Corporal, in the Machine Gun Section, 10th (1st Gwent) Battalion, South Wales Borderers. 10th (1st Gwent) Battalion, South Wales Borderers was raised at Brecon in October 1914 by the Welsh National Executive Committee. After initial training close to home they moved by end to Colwyn Bay and joined 130th Brigade, 43rd Division, which was renamed 115th Brigade, 38th (Welsh) Division on the 29th of April 1915. They moved to Hursley Park near Winchester in July 1915 but then to Hazeley Down for final training. They proceeded to France, landing at Le Havre on the 4th of December 1915. In July 1916 the 10th (1st Gwent) Battalion were in action at Mametz Wood on the Somme, suffering severe casualties. The Division did not return to major action for more than 12 months. In 1917 they were in action in the Third Battle of Ypres. From 31 July to 10 November 1917, the Third Battle of Ypres, finally enabled the British to attack at Ypres and breakout of the confines of the salient of trenches around it. The Third Battle of Ypres, or Passchendaele offensive, began with encouraging gains but terrible summer weather soon bogged it down. By August the offensive was clearly failing in its objectives and had descended into attritional fighting. New techniques by both sides led to agonisingly slow forward movement for the British, at enormous cost in casualties to both sides. Bad weather in October led to the battlefield becoming an impossible quagmire. in 1918 the battalion was in action on The Somme and Lance-Corporal Edmund Munckton was killed in action on 2 September 1918 and buried where he fell. He was 30 years old. In its edition of 4 October 1918 the Western Gazette reported "Mrs R Munckton, of 5 Smith’s Terrace, Newtown, has received information that her third son, Corporal E J Munckton, of the South Wales Borderers, has been killed on the battlefield. Corporal Munckton joined up at the beginning of the war, and has been in France since 1914 [sic]. In a letter to his wife, his officer states that he did not hesitate in giving his life for the Motherland. Mrs Munckton has four other sons serving. Three are on active service, and Private F Munckton, who has been twice wounded, is now in a Bristol Hospital." Edmund's his name is inscribed on the Vis-en-Artois Memorial, Panel 6, Pas de Calais, France, and his name is inscribed on the War Memorial in the Borough. The Commonwealth War Graves Commission certificate in memory of Edmond Munckton.